Optical Tools for Industry - O T I is a specialist company providing optical systems and design expertise to attain cost effective measurement and inspection. 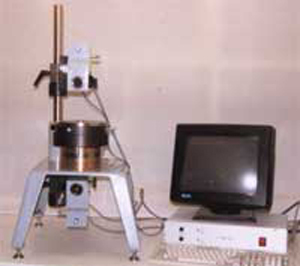 The OTI reflective centring equipment detects residual tilt by reflecting a focusable laser diode from a rotating surface and displaying the locus of the returned beam as a circle at high magnification onto the computer screen. The magnification is electronically variable such that in the initial stages, when the setting is grossly in error, the system can still be used. At maximum gain the sensitivity registers less than 2 seconds of arc. At any time in the process, reference may be made to the unique built-in calibration device. This displays a circle representing 0.5 minutes of arc tilt so that whatever the gain the error circle may be compared to the calibration circle and the error displayed. For an understanding of the principle of operation the Detector/Laser head may be regarded as an electronic autocollimator capable of viewing curved as well as flat surfaces and, as such, it's calibration is independent of working distance. Mechanically the devise is designed to make the task of setting and finding the returned spot easy being fitted with a coarse beam steering facility linked to a direct viewing screen working simultaneously with the electronic detector which itself is capable of fine adjustment using 2 micrometer stages. The information from the Detector/Laser head is processed through the electronic box, converted from analogue to digital and displayed on the monitor in the form of a circle. The screen of the monitor is split in half, one half displaying the top head, the other half displaying the bottom head. All parameters are controlled either through the electronic box or via the computer keyboard.